The Philippines is an archipelago comprising of more than 7,100-islands. It is thought that the earliest inhabitants of the islands arrived 40,000 years ago. Folks from Borneo, Sumatra and Malaya migrated to the islands; the original people were ancestors of the people known today as Negritos or Aeta. The Philippine Islands became a Spanish colony during the 16th-century and were under Spanish control for the next 330+ years. Spanish called natives Indios. Then, conflict arose – there was opposition to Spanish colonialism in the Islands. In steps José Protacio Rizal. In 1886, he studied at the University of Heidelberg and wrote his classic novel Noli me Tangere, which condemned the Catholic Church in the Philippines for its promotion of Spanish colonialism. Dr. Rizal returned to the Philippines in 1892 and created the La Liga Filipina, a political group that called for peaceful change for the islands. Implicated in the rebellion, he went into exile for four years. Meanwhile, Katipunan (Supreme Select Association of the Sons of the People) became an offshoot of La Liga Filipina and things started to get rough. Rizal quickly denounced the movement for independence when it became violent and revolutionary. William McKinley was US president and the causal event was the explosion of the battleship USS Maine in Havana Harbor, Cuba on February 15, 1898. However, many in America suspected that the US had colonial aspirations of its own. The Spanish‐American War ended 5-months after it began resulting in the US gaining the Philippines, Guam, Puerto Rico and Hawaiʻi. On February 4, 1899, just two days before the US Senate ratified the treaty, fighting broke out between American forces and Filipino nationalists who sought independence rather than a change in colonial rulers. While it is not clear if Rizal ever made it to Hawaiʻi, here are some ties of these events to the Hawaiian Islands. US foreign policy advocated the taking of the Caribbean Islands and the Philippine Islands for bases to protect US commerce. Meanwhile, Hawai’i, had gained strategic importance because of its geographical position in the Pacific. Honolulu served as a stopover point for the forces heading to the Philippines. On August 12, 1898, the United States ratified the Hawaiʻi treaty of annexation. At the time, there was no assigned garrison in the Islands until August 15, 1898, when soldiers landed in Honolulu for garrison duty. They set up camp in the large infield of the one-mile race track at Kapiʻolani Park. Their camp was named ‘Camp McKinley,’ in honor of the president. Camp McKinley remained in existence until Fort Shafter was opened in late June, 1907. The garrison was either artillery or coast artillery troops during this period. After the turn of the century, the plantations started bringing in Filipinos. Over the years in successive waves of immigration, the sugar planters brought to Hawaiʻi 46,000-Chinese, 180,000-Japanese, 126,000-Filipinos, as well as Portuguese, Puerto Ricans and other ethnic groups. To commemorate José Rizal, statues and monuments have been erected in Hawaiʻi and elsewhere. 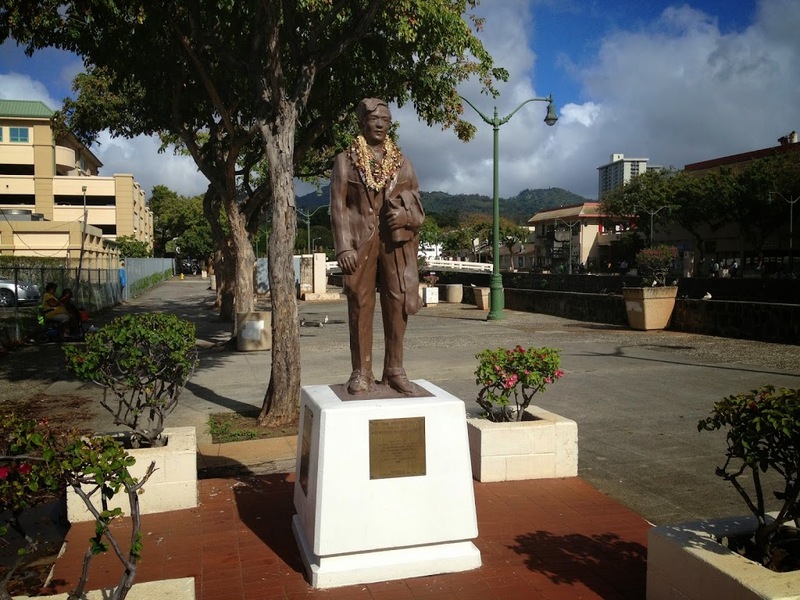 The image shows the José Rizal statue on College Walk on Nuʻuanu Stream in Honolulu. In addition, I have included other images in a folder of like name in the Photos section on my Facebook and Google+ pages.